Count on Cox Transfer for fast, dependable, cost-effective delivery service tailored to your needs. As we are growing outside the region, you will benefit from additional trailers and expansion of key routes. This will allow same-day deliveries on some routes without charging expedited rates. And if your company needs multiple pick-ups and deliveries, we’re happy to go the extra mile. Our seasoned, veteran company drivers are committed to the prompt, safe delivery of your goods. With our impeccable safety record and a reputation for reliability, Cox Transfer is known as a trucking industry leader in dry van service. We offer the flexibility of an LTL carrier and the speed of an expeditor without the additional expense. Experience a world of options, when you contact Cox Transfer for traditional full truckload service. Van dedicated operations are our specialty, including customized trailer configurations. We can tailor a solution to fit one to 100 trucks requirements. By utilizing Cox Transfer experience in managing transportation operations, budgeting and complete fleet management, you will be able to focus on the core of your business and product. 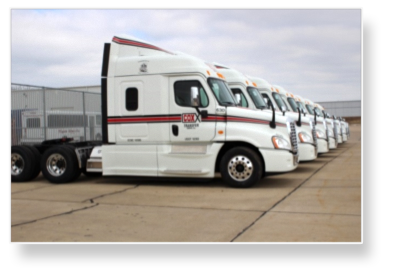 We will manage tasks from hiring drivers to ensuring compliance with US DOT, and FMCSA. We have solutions for seasonal and year-round services. Our specialized transportation solutions let you boost profits and enhance your reputation as a trusted name in your industry. As we are growing, we may not always have the capacity available to move your freight. However, our brokerage operation can handle seasonal and surge requirements with no interruption to your operation. Whatever your needs, rest assured our network of trusted carriers has the capacity to handle them.